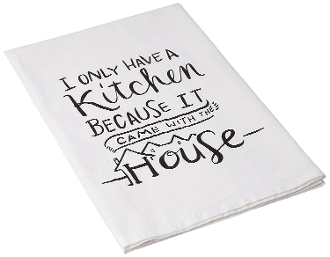 Primitives by Kathy A Kitchen Tea Towel, 28" x 28"
Our Products >> Primitives by Kathy A Kitchen Tea Towel, 28" x 28"
Primitive by Kathy Tea Towels are made from strong, high quality Cotton for softness and durability. Primitives by Kathy is a leading producer of high quality decorative box signs, home decor, and accessories. Made with a high quality Cotton.